When you think of almonds, the first thing to come to mind probably isn’t bees, but bees are an essential part of the almond-growing process. 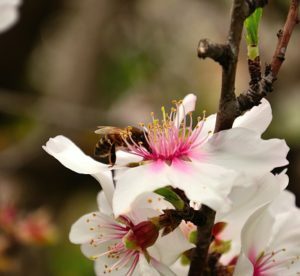 Almond trees need bees for cross-pollination. Actually, approximately 70% of our food and plants depend on bees, as well as help avoid the need to spray harmful pesticides in the orchards. But what happens when the bees are in crisis? Without bees, there can be no almonds. In fact, each of California’s nearly 1 million acres of almond orchards requires two hives. But California beekeepers have only a quarter of the needed hives. …Bottom line: There’s no single cause for the weakening or untimely demise of the tiny creatures that make the almond harvest possible. The idea of a mysterious “colony collapse disorder” has seized the public imagination — who among us does not love bees, or at least the idea of bees? — but it’s mostly a misnomer. Maisie Jane’s is committed to being part of the solution to save the bees. How can you help? When you purchase any 12oz. jar of our almond butter at any Whole Foods market in the nation, we’ll donate $.05/jar towards bee research. You can also plant native plants in your own yard and garden where the bees can be safe and get good nutrition. Help us create buzz by spreading the word and raising awareness!